Welcome back. Here is your second free video. The third one will arrive tomorrow. This video goes over the benefits of Thai Massage. Thai Healing Massage Academy is located in Chiang Mai, Thailand. This introductory video series and all our professional online courses were filmed in our studio in Thailand with Thai models. 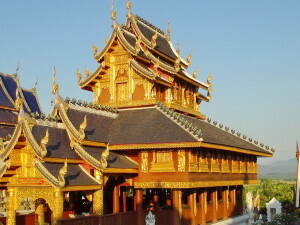 Chiang Mai is the second largest city in Thailand, a major cultural center and tourist destination. It has the biggest concentration of Thai Massage providers and schools in the world, and it is home to thousands of expatriates from all over the world. It is also one of the major healing arts centers in Asia. Every year thousands of people from all corners of the planet come here to study Thai Massage. I hope you will enjoy the second video. If you have feedback or questions, you can always contact me personally at shama@thaihealingmassage.com. If you like the video, please leave a comment below! thanks for sharing! smiles from israel. thanks for sharing! alot of blessings and light,michael. section two too, very good. Great video! I specially like how you emphasize the ‘magic of touch’ and creating a healing connection between the giver and recipient. You said it in one sentence: ‘relaxing is healing’ and if we can provide this to someone it’s the greates gift! Hi Coco, I’d be happy to chat with you on skype. My skype name is shama108. The best time for me is in the evening Thailand time, up to 11pm. That’s when I am almost always at home. I am also around during the day quite a lot. Greetings from a snowy, cold UK! Many thanks for your videos. I do like your style of Thai massage. I have often found myself using a version of your rocking technique during the treatments I give. So soothing and so good to treat tight Western hips with! Do you recommend Thai massage for Pregnant women? The side lying position seems ideal fro this with proper bolstering/ support. Thanks Andre, I am always happy to hear that people are getting good value from my courses. I am glad you joined the program. There is lots of good stuff coming, and even more in the works. I am constantly improving, expanding and upgrading my courses, and I welcome you to the growing group of satisfied students who have successfully learned Thai Massage through my courses. Hi Shama, i’m here in Thailand for the first time and had some fantastic massages during my stay. I’ve just started your freeby course and wll probably do the full one, followed by a visit to Changmai next winter as I plan to come back to this awesome country! Hi Diana, I am glad to hear that you had some great massages in Thailand. If you do the full course, I hope to see you in our forum and we can share experiences. Anyway, if you make it to Chiang Mai we can meet there! Hi Danny, I am always glad to hear when someone is benefiting from this course. Thanks for letting me know! Very Very thanks for sharing. I honestly thought that these videos were going to be a commercial… but I am really very pleasantly surprised at how helpful and informative they are. You do a really nice job at explaining thai massage. I like the comparison to western style massage, as that is what I am trained in. Do you feel as though a course in reiki would accompany thai massage well? I do not know a whole lot about working with energy. I understand the chakra’s and the meridians but I do not utilize them in my massage so far. Jessica, I think any type of energy work goes well with massage in general. However it is not necessary in order to be good at Thai Massage. Personally I have studied several types of energy work like Quantum Touch and Medical Qigong, and I feel that it has been an advantage for me, and it has definitely helped me in creating my style of Thai Massage. I use aspects of energy work in my work, but it is something that happens in my mind. I don’t use actual energy work techniques separate from my Thai Massage. Thai Massage is based on working with energy lines, but this is a lot less esoteric than it sounds. Reiki is a pure energy work system, whereas the energy work in Thai Massage is quite different. It means that the actual physical massage work is done by working along certain energy lines in the body. Reiki however has nothing to do with any physical manipulations at all. Reiki work does not follow energy lines. It works with a general energy field. Thai Massage however works with specific pathways similar to acupuncture, acupressure, or reflexology. Reiki can improve your sensitivity to energy, but it is based on a very different concept than Thai Massage. Thai training massage mini course for module two have expanded my analogies; is a very powerful way that we can use in are advantage to heal some one in need. Thai massage video mini course have given me a deeper insight on the right way to do Thai massage. the benefit of touch of healing is a wonderful benefit. thank you Shama. Thanks Maritza, I really appreciate your feedback! This is very insightful. Looking forward to more. I am a 62 years of age. I need a new beginning and Thai massage is it for me, thanks a lot for giving this golden opportunity. Good choice for a new beginning, Charles. I am glad I can help! Shama I am interested in using Thai massage to correct different degrees of scoliosis in my patients/clients. Would your course offer any guidance/instruction along these lines? So far the videos are getting me very excited to enroll in the full training videos. I am a private yoga instructor and I already incorporate a few Thai massage techniques in my sessions and the little I do, my clients LOVE it! I thought I saw something on your website about using the full training course as CE hours. If so, am I able to use them through Yoga Alliance and how many hours is it? You can get 30 CE hours via NCBTMB (National Certification Board For Therapeutic Massage And Bodywork) for the Complete Thai Massage course. I am not sure what the Yoga Alliance accepts, but I would be interested in finding out. Enjoying the videos thus far. I am an LMT looking to add something new to my practice. I think this maybe just what I was looking for. Thank you for the free mini course so that I could see what Thai massage really is before spending hard earned income on something I wouldn’t enjoy. I am looking forward to spending more time on this! I am liking these videos. Thank you! I am glad you like them, Felicia! Very informative and so easy to understand. Just watched introduction video nr 2. Looks promising. Have some questions, but want to finish the introduction series. My questions might be answered there. How many sessions are there in the introduction series ? There are 4 more videos to come. Thank you Deborah, I am happy to hear that it works well for you! What a treat!!!!!! Amazing series and free!!!!! I really would like to congratulate you on this fantastic program you’ve created! !